In Luke chapter 10, Jesus told His cherished parable about the Good Samaritan. Jesus began the story by saying, “A certain man went down from Jerusalem to Jericho” (Luke 10:30). 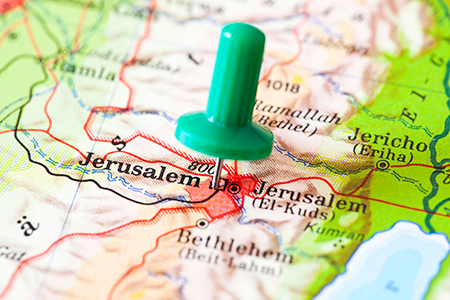 Many through the years have assumed Jesus was implying that Jerusalem was north of Jericho, since the man “went down” from Jerusalem to Jericho. However, a brief look at a map of first-century Palestine shows that Jericho is several miles northeast of Jerusalem. But how can someone go “down” from point A to point B, if point B is north of point A? As always, once all the facts are known, Jesus’ statement is shown to be trustworthy. Although Jericho may be several miles north of Jerusalem, it is more than 3,500 feet lower in altitude. Jerusalem is situated at an elevation of 2,550 feet above sea level, whereas Jericho is about 1,200 feet below sea level. There is no way for a man to journey from Jerusalem to Jericho without going down in elevation. Though south of Jericho, Jerusalem is much higher in altitude.